Thank you, Office Depot, for sponsoring today’s post! The other day I finally tackled our guest bathroom vanity. It had become a hot mess and needed some organization. Here’s the hot mess before picture. Since it’s the guest bathroom, I rarely go in there. The only times I find myself in there is to clean or, these days, turn on the faucet to drip so our pipes don’t freeze and burst (yay, negative degree temperatures). So needless to say, I never really cared much about the vanity organization. Out of sight, out of mind. But it was a small and quick organization project. I was done in less than 15 minutes. I dragged everything out of the cabinet, made a pile of things to keep, things to donate, and things to throw away. I strongly believe in having a stocked guest bathroom for your guests. 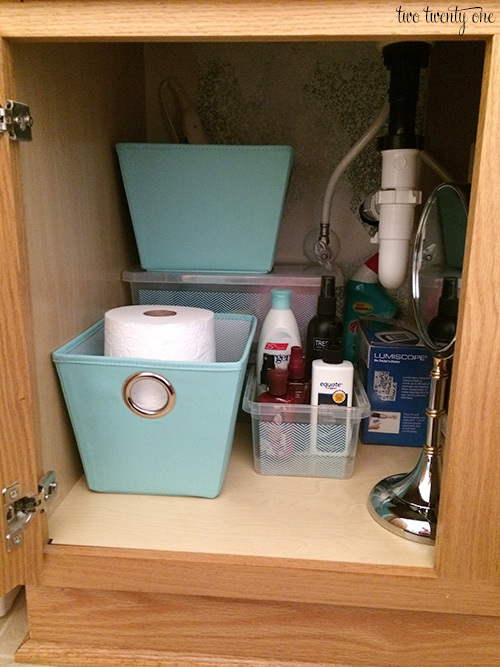 A couple years ago, I wrote a post about how I stock our guest bathroom with necessities (antacids, extra toothbrushes, toothpaste, contact solution, feminine products, etc.) HERE. I highly recommend reading it– especially if you don’t have a stocked guest bathroom. Also, it’s a good read. I put the things our guests will use most often in the front. Those things would be extra toilet paper and random toiletries. The toilet paper rolls are in a pretty fabric bin, and the random toiletries (hair spray, facial cleanser, lotion, body spray) are in a cute herringbone storage box. I stored some other random items in some medium boxes. Extra lotions and a loofah (in case a guest asks) in the top box and antibacterial hand soaps (I buy in bulk when they’re on sale for $1 at Kroger) in the bottom box. Like I said, I like having a fully stocked guest bathroom to make my guests feel more comfortable, so I also keep an extra hair dryer under the sink. Just in case. It’s now stored in the fabric bin that sits on top of the two storage boxes. 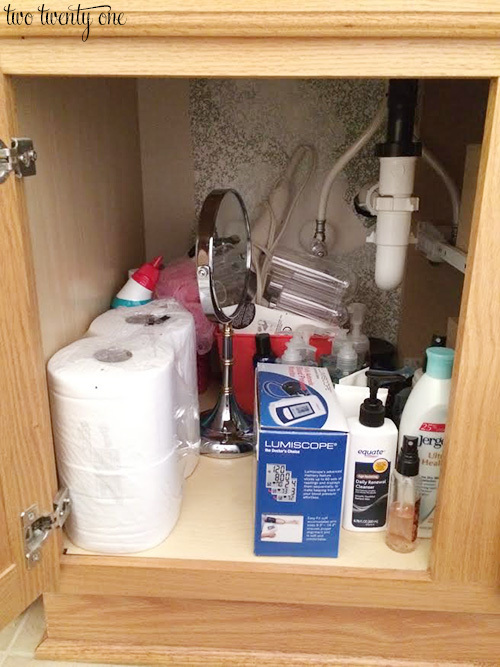 Only three items under the sink aren’t in some sort of container or bin– toilet bowl cleaner, blood pressure monitor, and a vanity mirror. Looking at these photos, I should probably paint the small section of wall in the back. But then part of me thinks no one ever opens up the door and looks long enough to see the poorly painted wall. 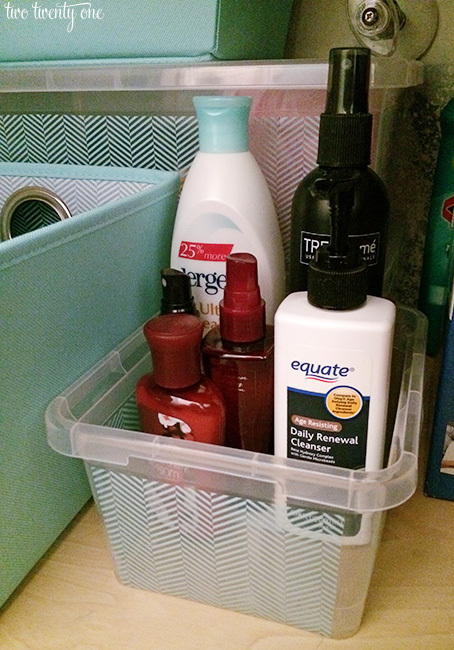 So, what do you think about the now organized guest bathroom vanity? Think this is something you could tackle in your home? This post was brought to you by Office Depot. As always, opinions are 100% my own. I love having a stocked guest bath, especially after having used a NON-stocked guest bath. There’s nothing worse than yelling “you’re out of toilet paper!” in the middle of a party. Really, who keeps the extra TP in a hall closet? Seriously! My parents do this, and I don’t understand why. All the toilet paper is stored in the hallway linen closet. I always make sure there’s at least two rolls of toilet paper in our guest bath. This looks great!! If we had a guest bathroom I would do this. We only have one bathroom in our tiny house but Ido keep extras in a little basket on the back of the toilet and always have extra tooth brushes in the medicine cabinet. I haven’t organized anything in ages. I am eager to get this recovery OVER so I can organize something, anything! thanks for the inspiration. i organized mine this weekend too. I also put all my old birchbox samples that i never used in a basket for them to try too. a little treat! 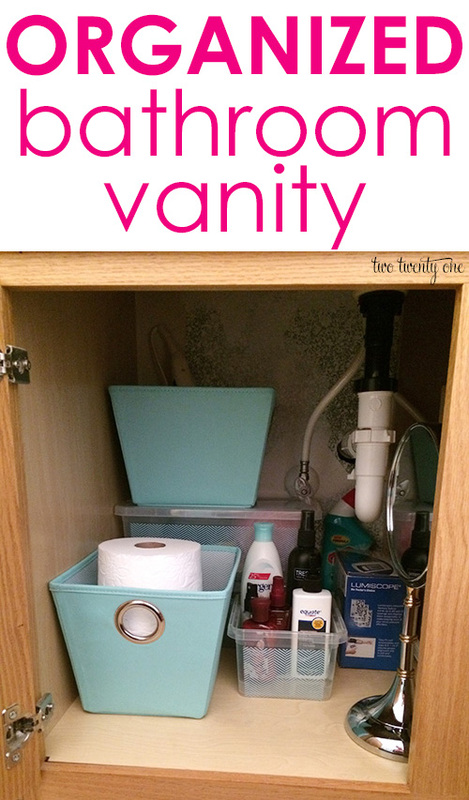 I started organizing our master and guest vanities not too long ago, but it’s not as organized as I’d like. I want to get some of those little drawers for feminine products, and smaller items. Elegant yet so simple. You did a great job in organizing your vanity. Our master bath is not a problem. It’s the guest bathroom that seems to be the challenge because as you pointed out, I rarely go in there. 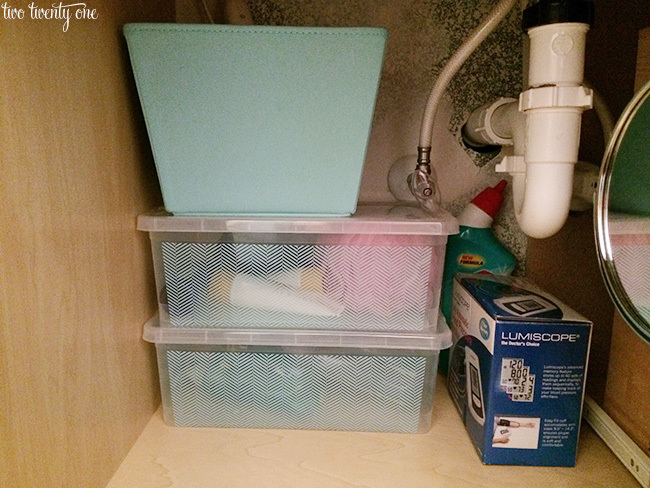 But you have given me some great ideas to make it more organized, neat, and orderly and also a blessing for anyone who is an overnight guest and uses this bathroom. Thank you for the very informative post, I enjoyed reading it! You could get some of the peel and place wallpaper from Target. It’s a lot like the contact paper that was very popular, but much easie to manage. A nice pattern would look great back there! Great idea and concept with awesome design by Two Twenty one……Please also share some interesting design for Bathroom vanity. 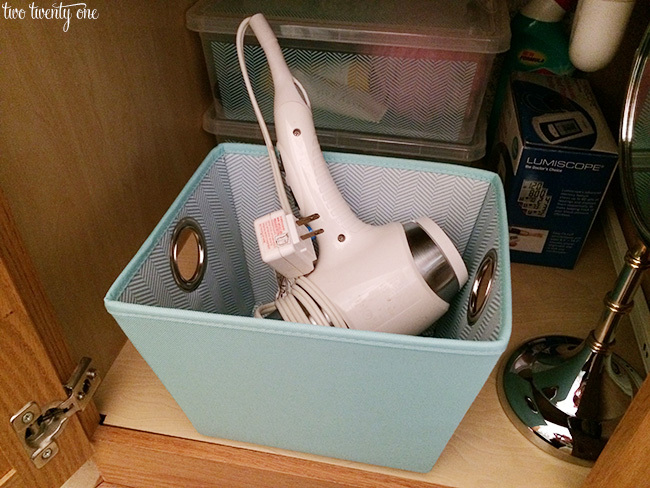 options to their closet organization and house storage issues. another headache. So they developed the Bin Warehouse. in the house. In 2005, Fold-A-Totes become the most recent addition to their growing line of storage items. My guests are always happy and promise to come back thanks to this blog that helped me in organizing the guest bathroom.